Thousands of Honduran migrants began a journey towards freedom on Oct. 13. However, the Mexican American border is not the only obstacle they must overcome. The barrier standing between them and this freedom is President Trump, who has long promoted the construction of a wall along the border and is unafraid of using tear gas to prove his point. The caravan left the city of San Pedro Sula in Honduras and began their mission to escape the violence and poverty in their home country. With a dangerously high homicide rate and increasing corruption within the government, many Honduran citizens fled their country with the hope of obtaining the American Dream. They have left their lives back in Honduras and are traveling with nothing but hope. Hope for a life with better work opportunities and a higher standard of living. Hope for building a better future for their families and setting stronger foundations for their children’s lives. More than 7,000 migrants have traveled this treacherous journey up to the southern United States border. They have found help in shelters in the border cities of Tijuana and Mexicali, but they have been warned that their presence cannot be supported for much longer. Aside from the fact that these cities do not have the funds to shelter thousands of migrants, they are also centers of crime and poverty with conditions that are not much better than the ones back in Honduras. Over 2,000 of these migrants decided to finally take the risk of attempting to enter America. Little did they know that they would be met at the U.S. border with similar conditions of violence and government corruption. Sunday, Nov. 25 began with Honduran migrants peacefully marching in attempt to protest the slow pace of the U.S. asylum claims process. At the current rate, many Hondurans are unsure of when they will be able to seek asylum, or if they will ever receive it. President Trump has persistently argued since the time of his presidential campaign that no one should be allowed to enter the United States illegally. Yet, he has made it practically impossible for these migrants to enter the country in a legal way. Seeking asylum is the only option for migrants who are trying to be processed at the U.S. border to legally enter the country. Hondurans are seeking asylum in America for protection against the persecution in their own country. However, migrants who applied for asylum have been waiting for months in border cities with no response and no idea of how long the wait will be. On Sunday, the protest against this unfair process of granting asylum soon grew into hundreds of migrants attempting to cross the border into America. The U.S. Border Protection responded to this by firing tear gas — emptying dozens of tear gas canisters. 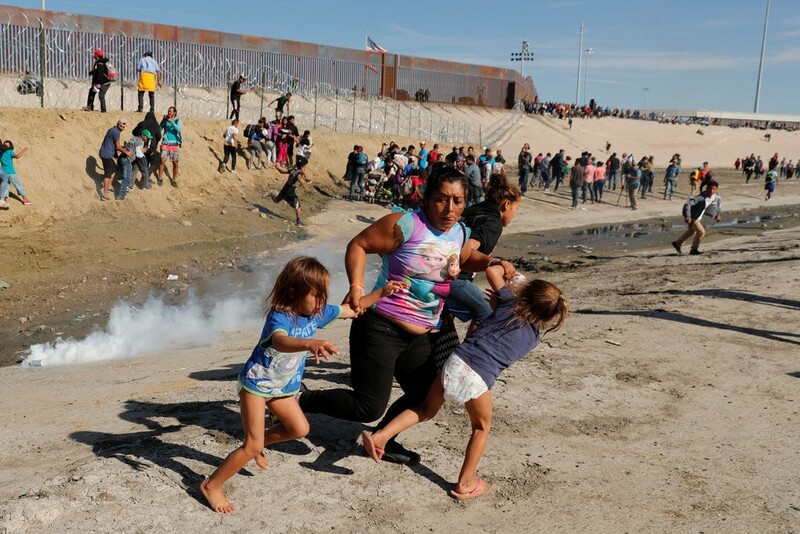 This tear gas did not only affect the migrants who were pushing past the border control officers and across the border, but also blew into the wind to harm hundreds of innocent men, women, and children who were merely in search of asylum. Throughout his presidency, Trump has enacted multiple roadblocks that are making it even harder for migrants to seek asylum. For example, he has gotten rid of refugee programs such as Central Americans Minors and has capped the number of refugees allowed into the United States in 2018 to only 45,000. Trump’s claim that many of the migrants are “stone cold criminals” is an example of his accusatory and offensive prejudice against Latin Americans. His false accusations are not supported by any evidence, and create a false image of hispanic immigrants for many of the Americans who blindly believe anything that their president is tweeting. It can not be said for certain that every single Honduran migrant is trying to get into the United States with pure intentions. However, the majority of migrants are coming in peace and in search of better lives. The events that took place at the border have convinced many migrants to give up on their journey and their dreams of seeking asylum in America. Some families are returning back to the poor conditions in Honduras, without any hope for a better future. Whether one agrees with President Trump’s policies or not, almost any empathetic human would agree that these actions were outrageous and inhumane. A plan must be put in place to deal with the thousands of displaced Hondurans waiting to enter America. Wow what a great article way to go Keemia!!!!!!!! !